We are proud to present these unique products - developed and produced in the heart of Denmark. The Facecream from our first line – DELICATE – is amazing! 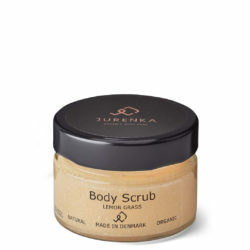 It is non-greasy, it adds moist to the skin and after a few days use, there is a noticeable difference. The Body Lotion from our first line – DELICATE – is neutral and minimal in its fragrance, so a delicate sense of smell will not be bothered. It nurtures, heales and adds moist to your skin. The Body Lotion from our second line – BOTANICAL – is with hawthorn and raspberry. The scent is lovely and suits also the sensitive skin because of its natural ingredients – without any allergens. It nurtures, heales and adds moist to your skin. Comes also in 200 ml. You are going to love our Pure Face Serum! The combination of hyaluronic acid and vitamin-C in the formula increases significantly the moisture content in the skin and leaves your skin silky smooth. Our organic deo serum is here! It is a deodorant – not an antiperspirant, so it allows your skin to breathe. It is very gentle for your armpit, your skin and you, this is why we call it ‘The conscious deodorant’. The Body Scub from our line – DELICATE – is fantastic. Gentle and still with a noticeable difference to your skin. The smell of lemon grass is fresh and wonderful.